Illinois homeowners thinking about going solar may have heard that the sooner they go solar, the more they’ll be able to benefit from the federal and Illinois solar incentives. In 2019, federal and Illinois solar incentives combine to cover about 60% of the purchase price of solar, but how much will incentives cover for Illinois homeowners in 2020 and beyond? For years now, the federal government has offered U.S. homeowners a tax credit equal to 30% of the price of an installed solar system, but the tax credit value is slated to decrease in 2020. Learn about the specifics of the federal tax credit and how to claim it here. In 2019, a $25,000 system would result in a $7,500 tax credit for the homeowner. 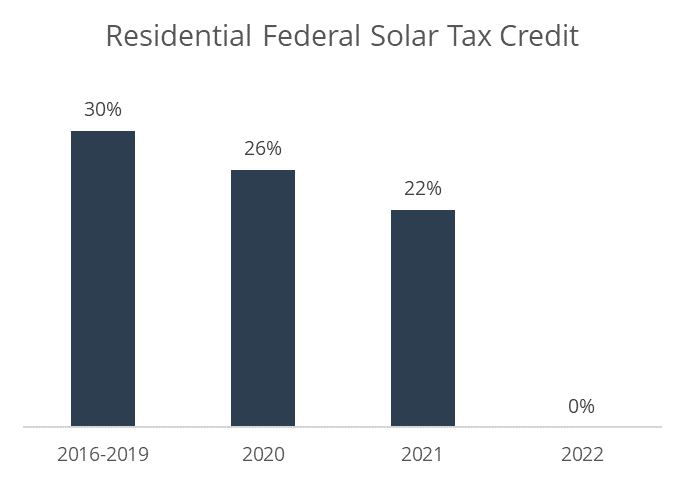 However, in 2020 the federal solar tax credit is slated to decrease to 26% and in 2021 it will drop even further to 22%. This means that if a homeowner waits to install their system, the tax credit they would receive for a $25,000 system would be $6,500 in 2020 and $5,500 in 2021 (a loss of $1,000 per year). The tax credit totally disappears for systems installed in 2022. The Illinois solar incentives available to homeowners come in the form of payments for solar renewable energy credits (or SRECs) from the utility. To ensure Illinois solar installers have an incentive to reduce costs, Illinois requires the prices of SRECs to decline as more solar systems are installed. This program structure is refered to as an adjustable block program (ABP), and Illinois’s adjustable block program is called Illinois Shines. Illinois Shines is administered by the Illinois Power Agency, which is responsible for setting prices for Illinois SRECs. The IPA’s goal is to set the prices at a level that allows the state to meets its legislated target of 25% renewable energy by 2025. Illinois Shines opened for participation on January 30, 2019 with the price per SREC for most residential systems set at $72.97. This price results in homeowners getting about 30% of the cost of their system covered by Illinois incentives, on top of the federal tax credit. Once the first block fills up, the price will decline. For each subsequent block of systems, the price will decline further. Although the blocks are based on the amount of solar installed and not anchored to specific dates, it’s likely that Illinois SREC prices will be much lower in 2020 than 2019. Illinois homeowners looking to maximize their benefit from solar incentives should consider going solar as soon as possible. Since the federal incentives are based on the year the system is installed, it’s important to allow enough time before the end of the target installation year for design, permitting, interconnection, and installation. Certasun is happy to provide an expert solar consultation and make it easy for you, in just one home visit, to evaluate your solar options and choose the best fit for your financial and energy goals. To get started, simply fill out the form below.